1While most of us were were asleep, Prasenjeet Yadav captured a brilliantly green meteor the other night! While most of us were were asleep, Prasenjeet Yadav captured a brilliantly green meteor the other night! The prepossessing beauty of Nothern Lights has got the entire world smitten. Thousands of people from different parts of the world travel thousands of miles just to see the glaring lights in the sky. But we often forget to see the beauty that’s closer home. 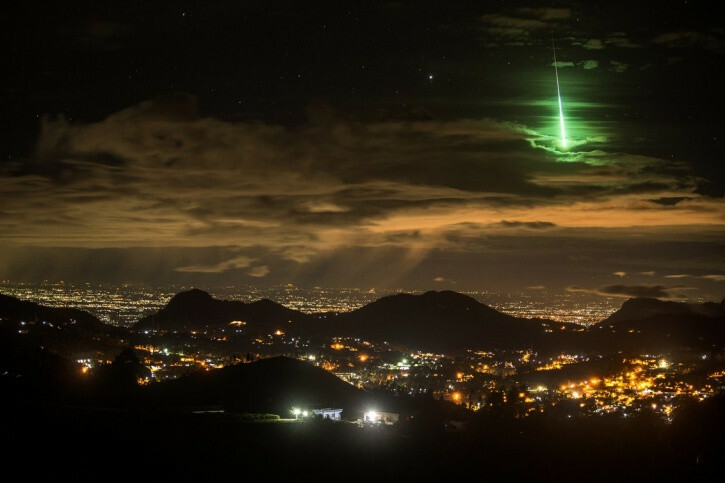 Yadav was asleep when this bright green meteor exploded over Mettupalayam, a small town in the mountainous Western Ghats region of southern India. But he had set a time-lapse rig on a nearby hilltop and it captured the beautiful image. Some 25 million of them hurtle toward Earth each day, but most of them are too small to track. Those you can see are tough to spot during the day, and most people are sleeping when they streak across the sky at night. Yadav won a National Geographic Young Explorers grant to document “sky islands,” the isolated mountain peaks that rise above the clouds along a 400-mile swath of the Western Ghats. He wanted a nighttime shot of Mettupalayam to show the area’s urbanisation. In the wee hours of October 9, 2015, Yadav drove into the mountains, set up his Nikon D600, and programmed it to take 15-second exposures every 10 seconds until 4:30 am. Then he made camp and dozed off until dawn. The next day, he reviewed the thousand or so images on his camera and spotted a brilliant flash of emerald light. At first, he thought it was a fluke, but much to his joy, several astronomers confirmed that it was a meteor.